DESCRIPTION: volume 7: The third Kira has been apprehended and Lights memories have returned. After manipulating those around him, human and shinigami alike, Light is now at the top. Until a new threat appears. volume 8: Unchallenged for so long, Light is unprepared when his sister has been taken hostage in exchange for the Death Note and not only is his family threatened, his positions as both Kira and L are as well. With two new adversaries, what will Light do now? 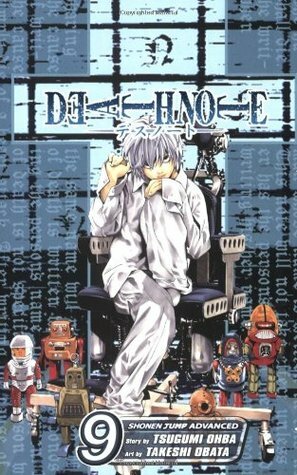 volume 9: Having failed the first attempt at getting the Death Note back from Mello, the make a second attempt with the help of Kira. Unfortunately, Near suspects the new L of being Kira and joins forces with Mello. 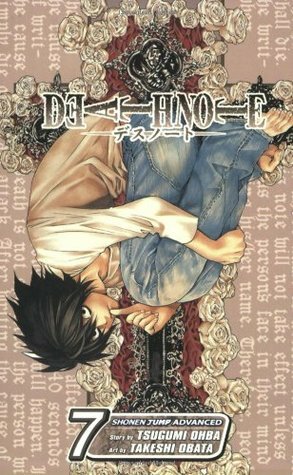 I’m sure from the descriptions, especially of volume 8, anyone reading this, even if they know nothing of Death Note, has some idea of what’s going on. Well, I don’t like it. As much as I love Kira, I actually don’t like Light. I’ll fan girl over some of those evil faces, but I don’t fan girl almost every time he shows up, as I did with L and Namikawa. So, with the two of them out of the picture, I’ve lost my eye candy. Ryuk is being a nuisance, but at least he’s cute and funny. Near and Mello though? No. Why Near? Why Mello? Near is not near to anything and Mello is not mello. Also, they make me want to play Yahtzee and eat chocolate. But they just piss me off. They aren’t anywhere near L or Lights level and if it wasn’t for playing dirty, they’d get nowhere. I know what’s going to happen. I’ve read the books, the mangas, watched the anime and live action movies. Whenever I re-read or re-watch though, I always hope things change. Like magic. My L lives, beats Kira, believes that 13 day rule, and becomes the new Kira. Although probably only killing those on death row. Then volume 9 is probably the worse volume up to this point. Light is being a complete idiot. Even if no one is doing what he wants, he’s a complete idiot. I understand he hasn’t had any mental stimulation since L, but that doesn’t explain how he could be so stupid and a couple kids are running circle around him. Even when he was completely stressed out before, he was still able to think at least fairly clearly. I may not be a fan of Light, but I am a fan of Kira and it’s horrible seeing him be so stupid. I’m also a fan of L and Light and these kids are making L seem like a complete moron.